An ATF agent was shot in the face Friday morning in Chicago, and a group of agencies have provided updates on their search for the shooter responsible. A federal agent was shot in the head on Chicago's South Side early Friday, according to police. Authorities said the shooting took place at around 3:18 a.m. in the 4500 Block of South Hermitage in the city's Back of the Yards neighborhood. The agent with the Bureau of Alcohol, Tobacco, Firearms and Explosives was working on a federal investigation with Chicago police officers when the shooting occurred, CPD spokesman Anthony Guglielmi said in a tweet. The ATF agent was taken to a hospital for treatment in critical condition, but will survive and make a full recovery, Celinez Nunez, special agent in charge of the ATF's Chicago field division, said at an afternoon news conference. Law enforcement declined to release the agent's name or age due to the ongoing investigation but said he is a Chicagoan. Authorities announced Friday afternoon that law agencies and a community activist are offering a $61,000 reward for information that leads to the arrest of suspects in the case. “The people who did this will not have a lot of friends,” said Jeffrey Sallet, FBI Chicago division chief, after announcing the reward. Nunez called for the community to work with law enforcement during the investigation. “I implore on everybody today to help us bring the assailants responsible for this to justice," Nunez said. "This is an all-hands-on-deck situation." Another officer was taken by ambulance to an area hospital for observation, Guglielmi said in a second tweet, but he added that CPD had not received any reports of a second agent or officer shot. CPD Supt. 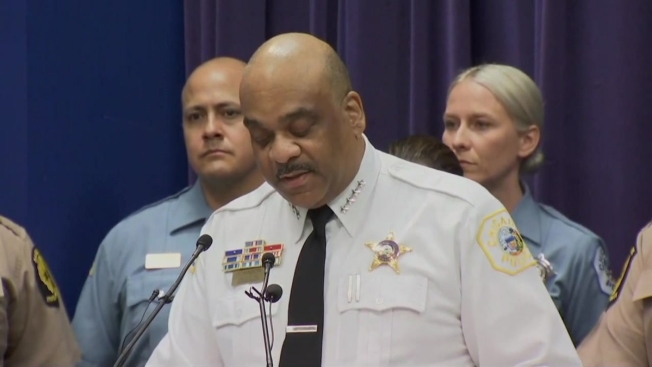 Eddie Johnson ordered the "full deployment of Chicago Police specialized units to assist" the ATF in the investigation, Guglielmi said, including the organized crime units, as well as area gang, saturation and gun teams. "You think we're going to take this lying down?" Johnson said Friday afternoon, addressing the suspects. "I got a message for you: We're coming." Soon after the conference, President Donald Trump spoke at the National Rifle Association Convention and once again used Chicago's gun violence as an argument against gun control. "We all know what's going on in Chicago, but Chicago has the toughest gun laws in our country," Trump said. "They're so tough, but you know what's happening." Trump went on to joke about banning automobiles as a way to stop terrorism and violence. He did not mention the shooting of the ATF officer. No one was in custody in connection with the shooting, according to police, who continue to investigate.